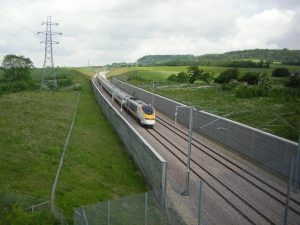 A Eurostar train on the Channel Tunnel Rail link in Kent (or HS1) – soon to be joined by HS2. On the 23 February the HS2 Bill received the Royal Assent and was enacted as the High Speed Rail (London – West Midlands Act (2017) (hereinafter referred to as the HS2 (Phase 1) Act). Thus, HS2 Ltd now has the requisite powers to commence construction of the first phase of the project from London to Birmingham. In the House of Commons the Secretary of State for Transport, Chris Grayling, announced that site clearance, establishment of depots, archaeological work and demolition work would start within weeks with major earthworks and so forth commencing by the end of the year: see Hansard vol 621 cols 1127-28 23 February 2017. 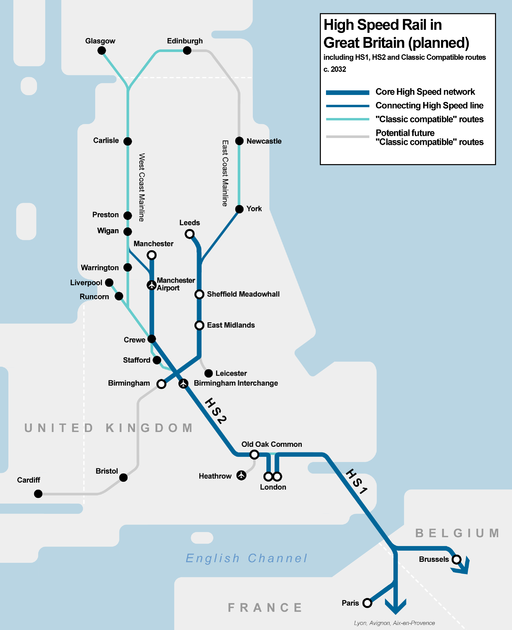 Schematic diagram showing what the UK’s high speed rail network will look like following completion of phases 1 and 2. The Bill endured a gruelling passage through both Houses of Parliament thanks to the length and complexities of the hybrid Bill procedure. The multitude of railway projects in the nineteenth century were authorised by private Bills as they were promoted by private enterprise. As HS2 is essentially a Government sponsored project a private Bill would clearly have been an inappropriate mechanism, However, a public Bill would also have been inappropriate as, although the project is a nationally significant infrastructure project, it has particular implications for specific sections of society, principally for those who live in the path or in close proximity to the route. 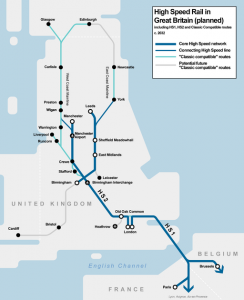 Thus, in common with all other major rail infrastructure projects of recent years such as Crossrail and the Channel Tunnel Rail Link (HS1), HS2 has been authorised by way of the hybrid Bill procedure. The process is lengthy and cumbersome due to the amalgamation of private and public Bill elements. The initial stages of the Bill follow private Bill procedure in that, after second reading in each House, a select committee is instigated. The purpose of the select committee is to hear petitions from those adversely affected by the scheme and to propose additional mitigation measures. Crucially, it may not question the need for the scheme as this decision has already been taken by Parliament at second reading. Historically, petitioning against a Bill has been a somewhat arcane art usually necessitating employment of expensive Parliamentary agents. 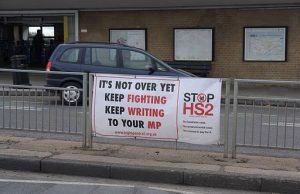 As regards HS2 efforts were made to demystify the process and a ‘petitioning kit’ was made available online for the benefit of would-be petitioners. Arguably, these efforts met with some success in that large number of petitions were submitted and a substantial number of petitioners appeared in person before the select committees in both the Commons and the Lords, although, as will be seen below, some argue that there is still much work to be done in terms of opening up and simplifying the process. Once the select committee has completed its work and published its findings the process becomes more akin to public Bill procedure in that the Bill must be considered by the Public Bills Committee in the Commons (Grand Committee in the Lords) before progressing to report stage and then third reading in each House. Aside from the complexities of the legislative procedure, the HS2 Bill had to accommodate the exigencies of EU law and the need to conduct an environmental assessment. This necessitated the completion of an environmental statement running to some 50,000 pages. 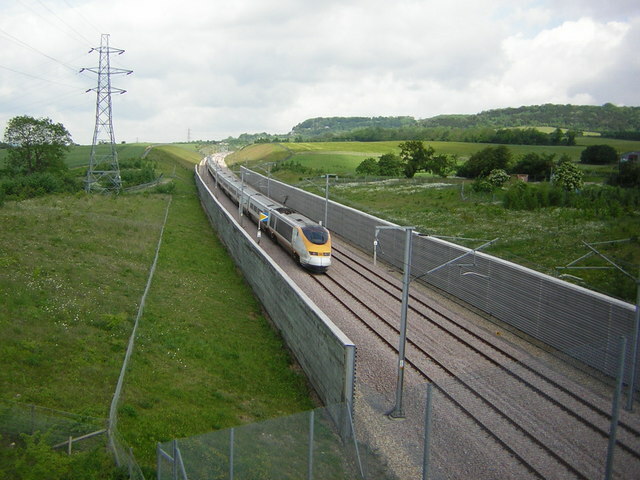 However, this failed to satisfy a number of objectors to the scheme who launched a judicial review in 2013 claiming that the original policy commitment to build HS2 should have triggered a strategic environmental assessment (SEA) and that Parliamentary procedures for authorising such projects were not commensurate with environmental assessment in any case. The Supreme Court rejected the claim for reasons which are set out in more detail in my blog post of 22 January 2014. Later that year the Court of Appeal rejected similar arguments pertaining to safeguarding directions designed to protect the route from conflicting development – see my post of 4 September 2014. A ‘Stop HS2’ banner outside West Ruislip station which will be near the northern portal of the West London Tunnel. MPs with constituencies along the route complained that their constituents found the petitioning process arcane and intimidating. Moreover, locus standi rules meant that there was only a limited amount they could do in terms of guiding them through the process and making representations on their behalf – see debate which took place at ‘ping-pong’ (consideration of Lords amendments by the House of Commons): Hansard vol 621 cols 816-36 20 Feb 2017. In an interview with the Financial Times a campaign manager for Stop HS2 complained that large landowners, who could afford barristers, got more out of the petitioning process than ordinary members of the public and conservation groups etc. In the light of such concerns it seems that a review of hybrid Bill procedure is already underway. There is certainly more that could be done in terms of rendering the process more user friendly from the perspective of the petitioner. However, given the need to ensure that enough people are given their say in the interests of democratic accountability, it is difficult to see how major reductions in the time and complexity of proceedings could be attained. There can be no doubt that many lessons will have been learned from the HS2 (Phase 1) Act and recent experience gained from the Crossrail Act 2008. In fact, it is noteworthy that, despite the fact that it is a much larger project and that there was a far greater number of petitions to consider, the HS2 (Phase 1) Bill managed to navigate its way through the legislative process in a very similar timeframe to the Crossrail Bill. Thus, there can be no doubt that, by the time they have endured three High Speed Rail Bills and a Crossrail 2 Bill, the Select Committees will have been honed into well oiled machines, not unlike the select committees charged with scrutinising the myriad private Bills under which the railways were authorised in the Victorian era. Nevertheless, there may be scope for reducing duplication by, for example, establishing some form of special joint select committee rather than allowing petitioning in both Houses. It remains to be seen what steps, if any will be taken. At this point mention should also be made of the Planning Act 2008 which was designed to expedite planning procedures for major infrastructure projects in the wake of the notorious Heathrow Terminal 5 public inquiry which sat for 524 days and contributed to a planning application process which took 8 years. Strictly speaking, any major rail project ought to be authorised under the 2008 Act but the HS2 (Phase 1) Act expressly exempts the project from the ambit of that Act. It seems that, where long linear projects are concerned, the hybrid Bill is still the most practical means of avoiding duplication and bringing all the requisite powers under one roof. We await the introduction of Bills for phases 2a and 2b, and indeed Crossrail 2, with anticipation with a view to ascertaining to what extent, if at all, any of the aforementioned concerns have been addressed.